At the 2012 NatRoad Conference held over the 3rd and 4th of August on Queensland’s Gold Coast, Freighter General Manager Rod Cunningham addressed the 200+ delegates on the issues facing the transport industry as increasingly more operators field requests regarding the transport of equipment for the mining boom. Following a presentation on the mineral resource sector earlier in the day by the Heavy Vehicle Road Operations Project Officer from Queensland’s Department of Transport and Main Roads, Warwick Williams, Cunningham addressed the issue of purpose built equipment for this sector. “Freighter has a history of making tough trailers for tough conditions,” said Cunningham. “One great example is some 25 year-old Freighter semis we found recently working in the Ok Tedi mine in Papua New Guinea. These are some of the harshest conditions in the world. Trailers are bouncing down the road loaded with heavy equipment every day and 25 years later they’re still active. The Outback has used and built on that history, to provide a stronger, more reliable trailer for Australian industry. 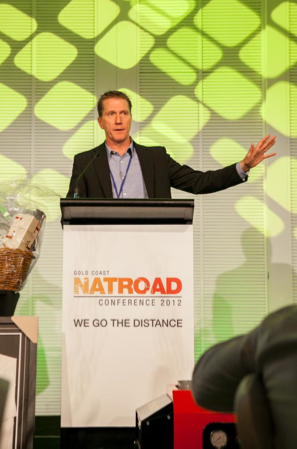 MaxiTRANS supported the 2012 NatRoad Conference as a Gold Sponsor, part of which included sponsoring the annual dinner auction. Freighter, one of the well-known brands owned by the MaxiTRANS group, worked with NatRoad to offer an Outback drop-deck semi-trailer for sale at the auction. Following Cunningham’s presentation, bidding was fierce, with the trailer finally selling well above its starting price.